In this "brilliant social satire of life among the 1 percent of the 1 percent" (The Washington Post), Sophie McManus presents a contemporary American tragedy of breathtaking scope. The Unfortunates is the story of a wealthy family coming to terms with how their privilege and entitlement means nothing in the face of an uncaring universe. A larger-than-life heiress to a rubber baron’s fortune, once known for her cruel wit as much as for her tremendous generosity, Cecilia Somner is now in opulent decline. Afflicted with a rare disease and touched by mortality for the first time, her gilded, bygone values collide with an unforgiving present. Now, along with her troubled son, George, and his working-class wife, Iris, CeCe must face the Somners’ dark legacy and the corrupting nature of their fortune. As the family struggles to cope with their rising misfortunes, the secrets and lies between matriarch, son, and daughter-in-law grow entangled. CeCe’s condition topples her world, giving her a glimpse at how the rest of society deals with disaster, changing her perspectives on medical marijuana, physical and mental illnesses, housing crises, and LGBTQ families. But her realizations come too late as the Somners are besieged by a startling turn of events as unforgettable as it is unexpected. While no riches can put things right for the unfortunate Somners, when all is lost they learn what life beyond the long, shimmering shadow cast by their dynasty may become. 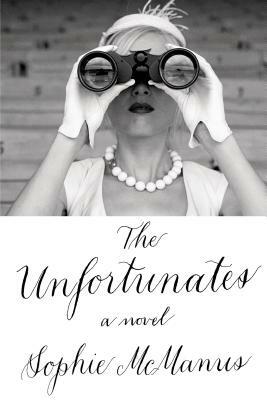 "A strong, gripping debut" (Entertainment Weekly), The Unfortunates is a hilarious and heartbreaking novel about a prominent family on the edge of ruin and a meditation on love as delusional obsession, as transformation, and ultimately as a coming to grace. SOPHIE McMANUS was born in New York City, and she received her BA from Vassar College and her MFA in creative writing from Sarah Lawrence College. She is a recipient of fellowships from the Fine Arts Work Center in Provincetown, the Saltonstall Foundation, and the Jentel Foundation. Her work has appeared in American Short Fiction, Memorious, and Tin House, among other publications. She teaches writing in Brooklyn, New York. The Unfortunates is her first book.